Movie star, martial arts innovator, philosopher, cultural icon—Bruce Lee was all of these and more. A singularly complex man, Lee holds our attention in his vice like grip just as strongly today as he did back in 1973, the year most Americans were formally introduced to him as the star of Enter the Dragon and also the year he tragically died at the age of 32. With his singular blend of physical prowess and metaphysical wisdom, coupled with his tragic untimely death, legendary Chinese-American martial artist, philosopher, and filmmakerBruce Lee (1940-1973) is one of those rare cultural icons whose ethos and appeal remain timeless, attracting generation after generation of devotees. Inspired by the core principles of Wing Chun, the ancient Chinese conceptual martial art, which he learned from his only formal martial arts teacher, Yip Man, between the ages of thirteen and eighteen. When he left Hong Kong in 1959, Lee adapted Wing Chun into his own version, Jun Fan Gung Fu — literal translation: Bruce Lee’s Kung Fu — and popularized it in America. Bruce Lee was an all-around athlete, and the result was a body that Joe Weider once described as the most defined he had ever seen. Over 40 years after Lee’s tragic death, people continue to be inspired by his special combination of speed, strength, and flexibility. The simple discovery of a few new photos of him shirtless is still enough to earn a cover story. Of course, Lee never trained solely for the purpose of looking good. His aim was to develop a functional body, and the appearance was a byproduct of his training. Training, he said, was “the art of expressing the human body.” Here’s how he did it, and how you can do the same. Any conversation about Lee’s training has to begin with his martial arts practice. Having begun his learning from the late grandmaster Yip Man in the Wing Chun style of Kung Fu, Lee kept progressing until he had formed his own method, Jeet Kune Do. Unlike more traditional styles, Jeet Kune Do was not bound to any rigid forms. It was, Lee said, “a style without style,” a free flowing manner of fighting that used whatever worked. Lee would often say that when you hit a heavy bag, you shouldn’t do it passively. Imagine that the bag is your worst enemy, and give it all you have. He also emphasized the importance of never leaving oneself vulnerable to attack, even while practicing. 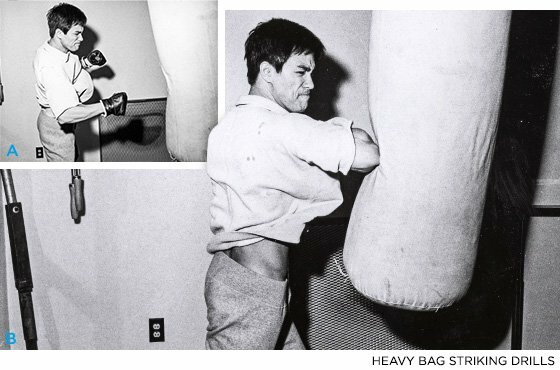 Lee was continuously moving, feinting, and side-stepping while training on the heavy bag to simulate a real fight. He believed a martial artist who didn’t take practice time this seriously would never be able to transfer what he learned in the dojo to the streets. Detailed below is the basic Bruce Lee weight training program Bruce Lee used from 1965 to 1970 in order to bulk up from 130 to 165 pounds, adding 35 lbs. of pure strongman muscle on a 5’7” frame. Eventually, he found the added mass from bodybuilding too cumbersome for his quick strike fighting techniques and in 1970 evolved his workout for pure strength instead of size. That “power without bulk” routine can be found on the Bruce Lee Training Workout for Muscle Definition, Strength & Power page. 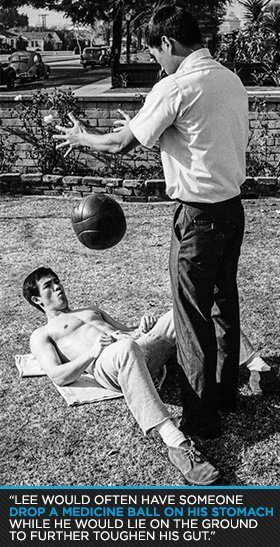 With the assistance of two bodybuilding buddies in San Francisco, Lee devised a mass, bulk and size-focused three-day-per-week (Tuesdays, Thursdays and Saturdays) Bruce Lee bodybuilding program that he used from 1965 to 1970. This Bruce Lee weight training workout for muscle growth emphasizes the legs, triceps, biceps, and forearms, all of these being the muscle groups used most frequently as a martial artist. The only record of Bruce Lee’s bodybuilder weight-training routine during this time is a 1965 gym card he filled out at the Hak Keung Gymnasium in Hong Kong. The Bruce Lee weight training workout from his 1965 gym session, detailed below, was partially excerpted from the classic book “The Art of Expressing the Human Body” by Bruce Lee & John Little. You can buy it today from Amazon.com in theBruce Lee Books section. Squats develop the quadriceps muscle group (at the front of the thighs), in addition to the glutes, hip flexors, hamstrings, calves, lower back, trapezius, abdominals and shoulders. The quadriceps group is the most powerful in the body and these muscles can withstand a lot of work. Place a barbell on your shoulders and lower yourself to a full squat position. From this position, rise to a fully standing one. Repeat for 3 sets of 10 repetitions. The French press develops the tricep muscle at the back of the upper arms. You can either stand or sit, whichever is more comfortable. head. Only your elbows are bent. From the lowered position, press the weight overhead by moving your forearms until your elbows are locked. Repeat for 4 sets of 6 repetitions. With a dumbbell in each hand, lean back on an incline bench. Let the weights extend the arms to a natural hanging position. From there, curl the weight to your shoulders. Return to the original position and repeat until you have completed 4 sets of 6 repetitions. Inclining the body isolates the stress of this movement to the biceps muscle on the front of your upper arms in this Bruce Lee weight training exercise. muscle (at the front of your upper arms). bench with a dumbbell in your right hand and the elbow of the arm holding the weight braced against the inside of your right thigh. Curl the weight to your shoulder. Do this movement slowly and watch your biceps while you work. Repeat for 6 repetitions. Start with your arms extended straight down. Curl the bar upward, bringing it as close as possible to your shoulders. The upper body may move very slightly. Form is a real priority here. Repeat for 3 sets of 8 repetitions for this Bruce Lee weight training workout. The triceps stretch is a single-arm version of the French press. Begin with a dumbbell held at arm’s length overhead. Lower the dumbbell to the back of your neck, keeping your biceps as close to your ear as possible. (This will keep upper-arm movement to a minimum). From this position, bring the dumbbell to arm’s length again. Contract the triceps vigorously as you extend the arm overhead. Lower and repeat until 3 sets of 6 to 8 repetitions have been completed. This Bruce Lee muscle exercise builds strong wrists, forearms, biceps, triceps and brachialis muscles. of the body, with the wrists turned up at the bottom of the outward arc and turned down on the inner arc. Perform three sets of as many repetitions as possible (or as Bruce Lee wrote, “infinity”). The reverse curl affects the upper and outer forearm muscles, the brachialis muscles and the biceps. Take a shoulder-width grip on a barbell, with your feet set shoulder-width apart. Stand erect, with your arms hanging down at your sides and the barbell resting across your upper thighs. Press your upper arms in against the sides of your rib cage. Without allowing your torso to move forward or backward, slowly curl the bar, bell upward in a semicircular arc, from your upper thighs to a point directly under your chin. Squeeze your forearms and upper-arm muscles as tightly as possible for a moment, then slowly lower the weight back along the same arc to the starting point. Repeat for 4 sets of 6 repetitions for this Bruce Lee bodybuilding workout. Pushups are excellent for the chest, shoulders, and the back of the upper arms (triceps). Place your hands approximately shoulder-width apart. Hold your body perfectly straight and exhale as you push your body up until your arms are straight. Pause. Inhale as you lower your body to the floor, allowing only your chest to touch. Your stomach should still be an inch or two off the floor when you touch with your chest, because your toes lift the body up a bit. Repeat for 3 sets of 10 repetitions. Endurance training wasn’t an afterthought to Lee. He knew his strength training was limited without an equal focus on stamina, and he used several modalities to achieve his supreme levels of cardio conditioning. Running: For Lee, running was a form of meditation in addition to conditioning. It was the time for him to be alone with his thoughts. He started most Mondays, Wednesdays, and Fridays with a run of several miles. His favorite distance was around 4 miles, which he would run in around 20-25 minutes, changing tempo throughout. After a stretch of easy, even strides, he would sprint for a short distance, and then return to easier running—similar to today’s interval training protocols. He would also shuffle his feet while running. Somewhere between his kicks, weights, and cardio, you probably realized that Lee’s training style isn’t for everyone. He devoted hours every day to physical activity —after all, it was a crucial part of his livelihood. The rest of us may not be able to match his type of high-volume physicality, but we can still take influence from his visionary approach to fitness. 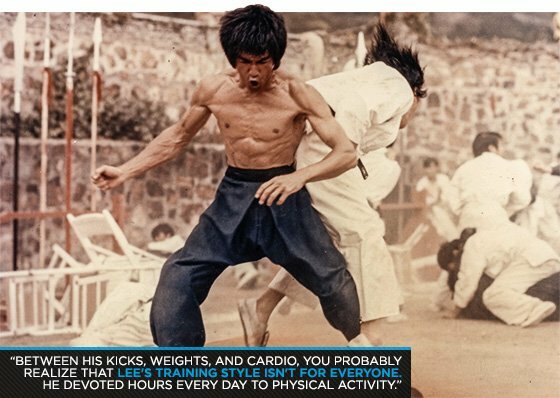 Here are two scaled down Bruce Lee-inspired training programs that could be made to fit with just about any busy schedule.